What is a captcha votes? Captcha votes are a test of the user for reality. Recently, votes are being wound up not by real people, but by bots or special programs. To avoid software cheat voting. Administrators resort to harsh measures — they supplement the authorization process with the Capcha test. What is a captcha and how to determine that it is necessary to enter it for voting on a site? In essence, captcha is a test of the user for reality. Recently, votes are not by real people, but by bots or special programs. To avoid software adding votes, administrators resort to harsh measures — they supplement the authorization process with the Capcha test. Roughly speaking, this is a picture in which characters are most often distorted. They can be of different sizes — heights, thicknesses, different fonts and colors can be used. Additionally, noises are created on the background or stripes are added to make the label more difficult to read. This is all done so that the user makes at least a little effort reading the written. Next to captcha there is an input field, where, strictly speaking, you need to enter these characters. To this, administrators can also add the «Update» button (if the text is completely unreadable) and the button, when clicked, the text will be announced by the program. Both of them carry only auxiliary functionality and in no way cancel the user’s verification of authenticity. 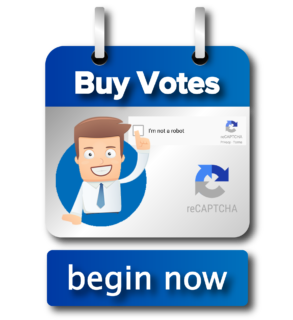 Captcha votes – a vote, in which You need to confirm the votes from a unique IP address and enter the verification code or choose the right picture, etc. You can buy more votes, than indicated in «the package buy votes». And also, we have a special offer «Unlimited package». For more information, please, contact us through Live Chat or feedback contacts. I have read TERMS AND CONDITIONS and REFUND POLICY.